Black Eyed Susan, AKA BES, is a proven female, and a terrific mother. Black Eyed Susan has given this farm three very gorgeous animals, with the two youngest, with a fiber micron counts of under 20 (whom have just recently been sold!). BES is very patient, and very available to human touch and well halter-trained. Truly an attentive mom, BES is delightfully sweet, adorable and easily hugged. She has been bred late June, 2009, to our multiple champ and 16-Blue Ribbon winner, CT Estrada (Medium Fawn), for a June, 2010 baby. Black Eyed Susan will make a terrific addition to your herd. 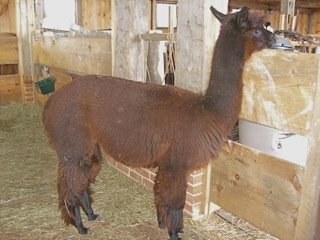 Note: We will keep either BES or her daughter in the herd at Island Alpaca Farm. Both are currently available for sale. 2007: 24-- a very respectable micron count for a dark brown female at the age of 8. 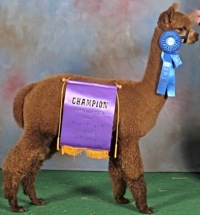 BES has been bred to our notable CT Estrada for a July, 2011 cria. Link to his listing to see the wonderful rewards of his show career 6x C/R Championships and 20 Blue Ribbons. Daphne is a true black with White markings. Sire is the son of the incomparable Peruvian Bueno-- and full brother to Peruvian Dakotia, sire of MFI Peruvian Jericho!